Hey y'all! Here we are, the day before the last day of 2015. Like most of you I am reflecting on the past year, and thinking of how I want to grow in the coming one! Part of that, for me anyway, is setting up my new Happy Planner. Last year my friend introduced me to the word of planners. Yes, I do mean world. There are Facebook groups designed around these things. Washi tape, stickers, stamps, pens...OH MY! I was totally sucked in, and am now a bonafide planner junkie! 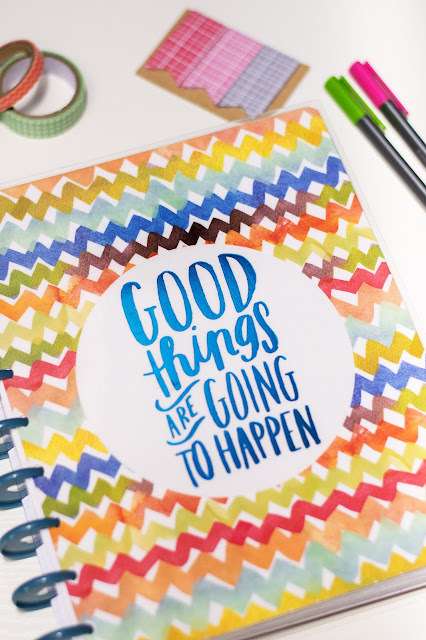 Last year I purchased the Erin Condren Life Planner, but after using it for nearly a year I realized something. 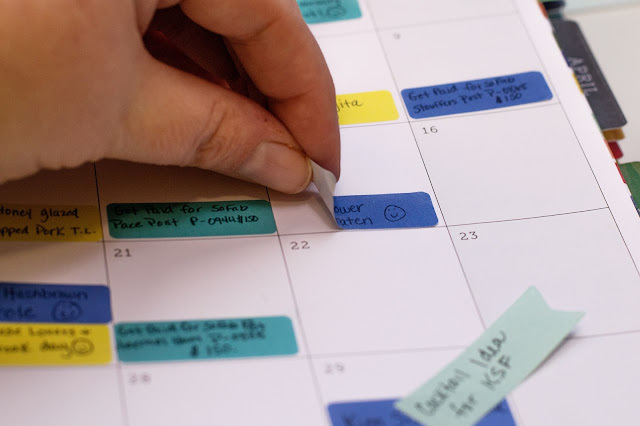 I didn't need a planner to organize my life. As a stay-at-home wife, with no children, my life really isn't all that hectic. I did, however, realize that as my blog grew I needed more organization there. 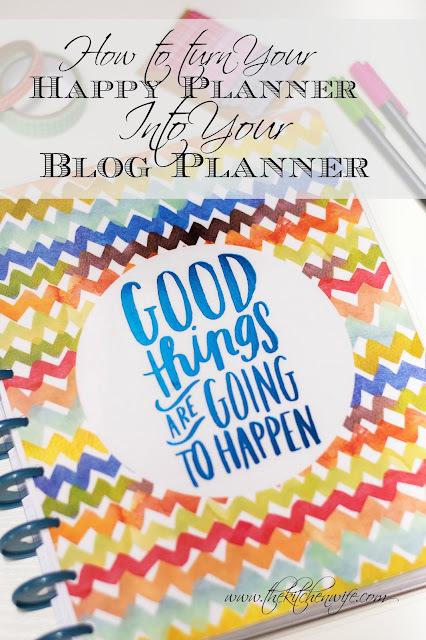 So when it came time to purchase my 2016 planner, I, one, went with the Me & My Big Idea's The Happy Planner, and two, set out to discover how to set it up as my blog planner. 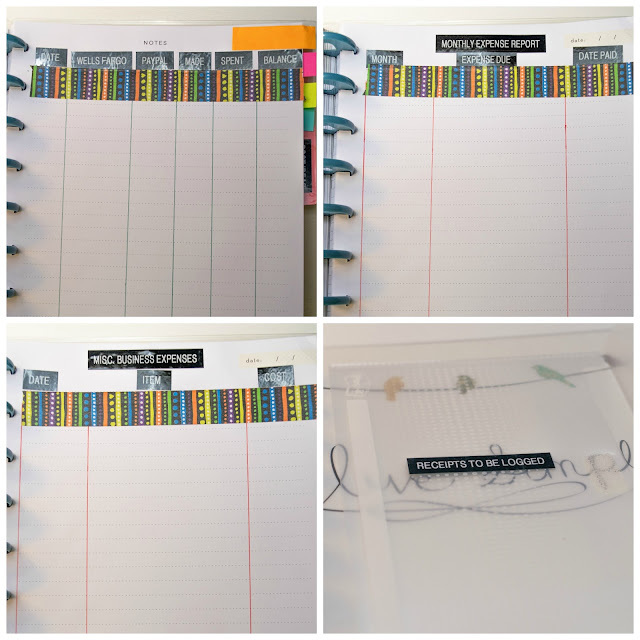 I chose The Happy Planner because it's set up very similarly to the Erin Condren, but, at retail will run you around $25.00 as opposed to the Erin Condren Life Planner, which can cost you $50.00+. 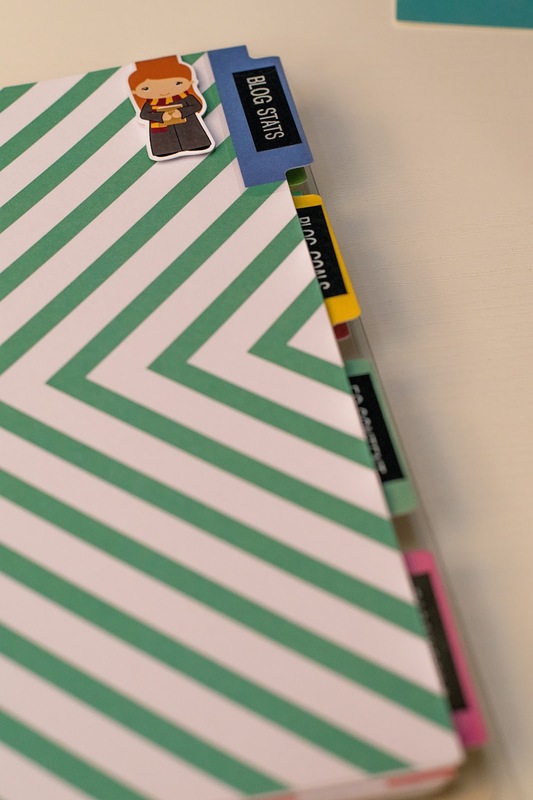 I also liked the fact that The Happy Planner operates on the Arc system which means you can remove the pages to write on them, AND you can also customize the planner to your personal needs by adding pages to it. However, when it came to setting it up, I discovered something. NO ONE had anything out there as to how they did it! I watched HUNDREDS of videos on YouTube, and read countless blogs on the subject, and NOTHING. 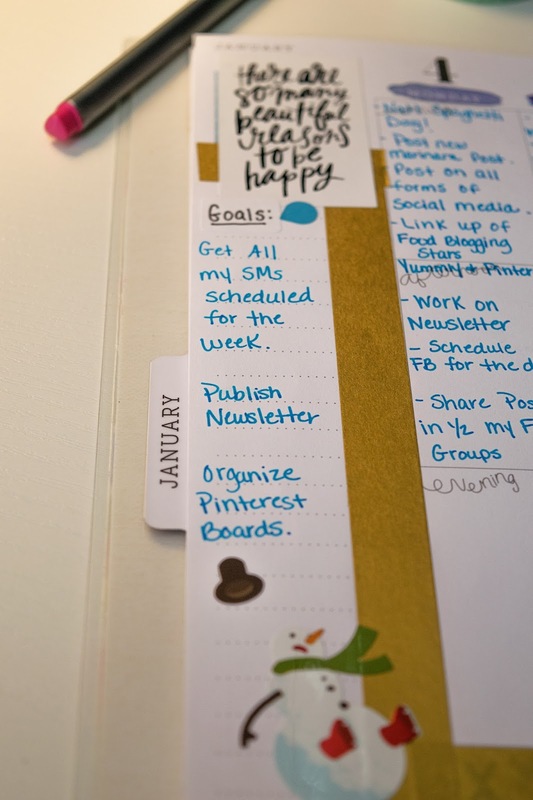 So I began to take note of the things I liked from blog planners that I found on line and began to set up, what I think will be, a very functional and productive blog planner for 2016. So enough of my rambling, let's get started! 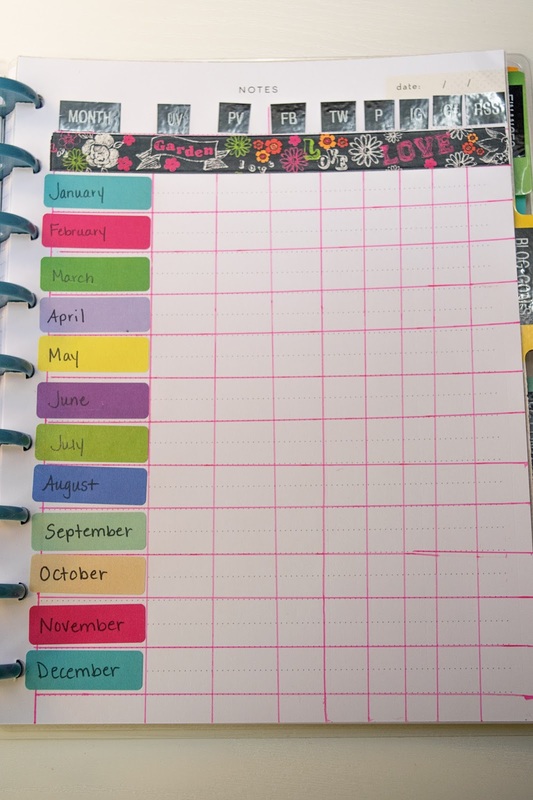 Just like the Erin Condren, The Happy Planner has a Month-at-a-Glance page. I like to use this as my editorial calendar. I post on Monday, Wednesday, and Friday. I have those posts on labels so I know what I am posting when. Not to mention, I know what I need to make the previous month so that I can stay a month ahead of myself. I also have any sponsored post due dates on there, when I will receive payments for work completed, and other important dates I need to remember. 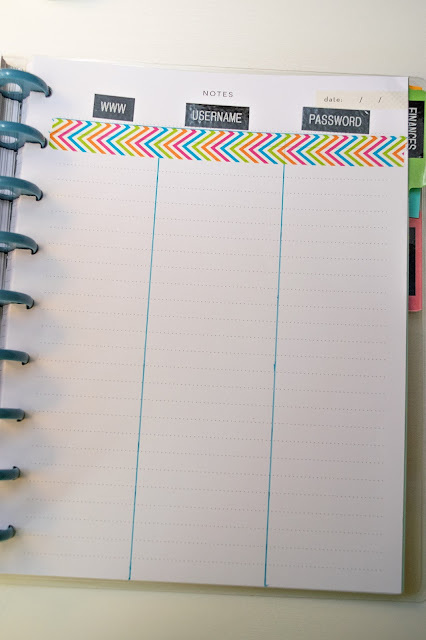 The reason I use the labels instead of just writing in the planner is because they are repositionable. If I need to move something, or something doesn't work out, I can simply peel it up and move it. now I don't have a mess in my planner. 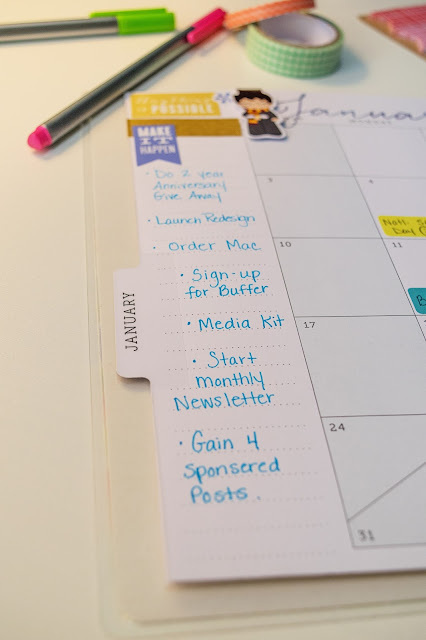 I also like to use the "Notes" area in the sidebar of my MaaG (month-at-a-glance) page to write down my monthly goals for my blog. 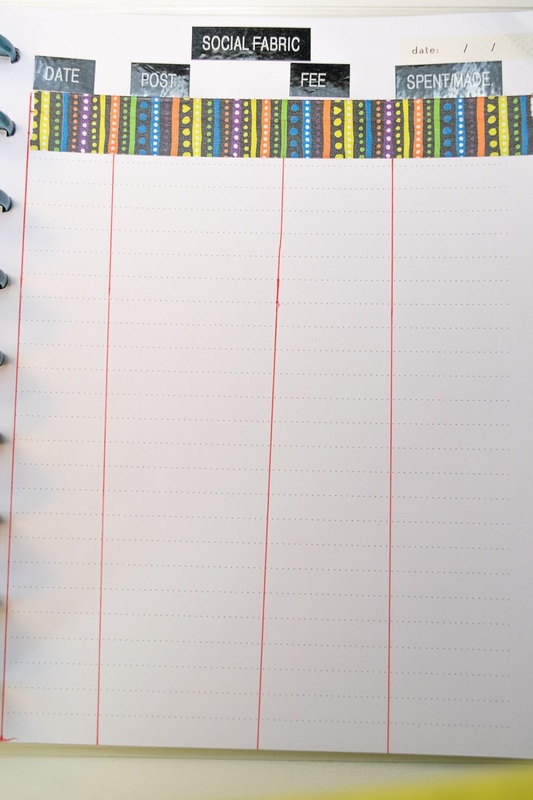 Again, like the Erin Condren, The Happy Planner follows a vertical layout style. I really like this. Often times the three boxes are labeled "Morning", "Afternoon", and "Evening". 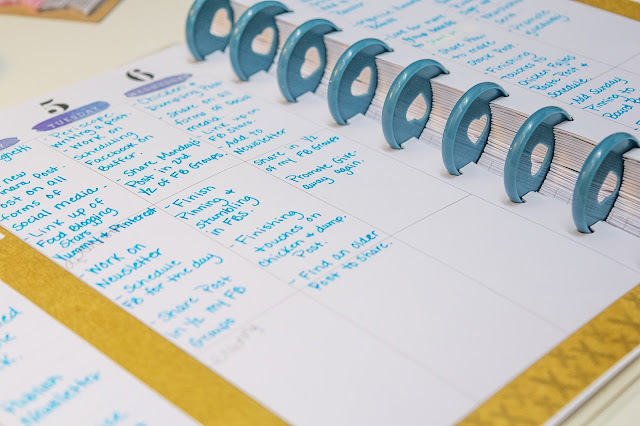 Personally, I totally ignore that, and use each column as a "To-Do" list each day. This is what works for me right now. As the year goes on I may develop that system a little more, but for now this works. 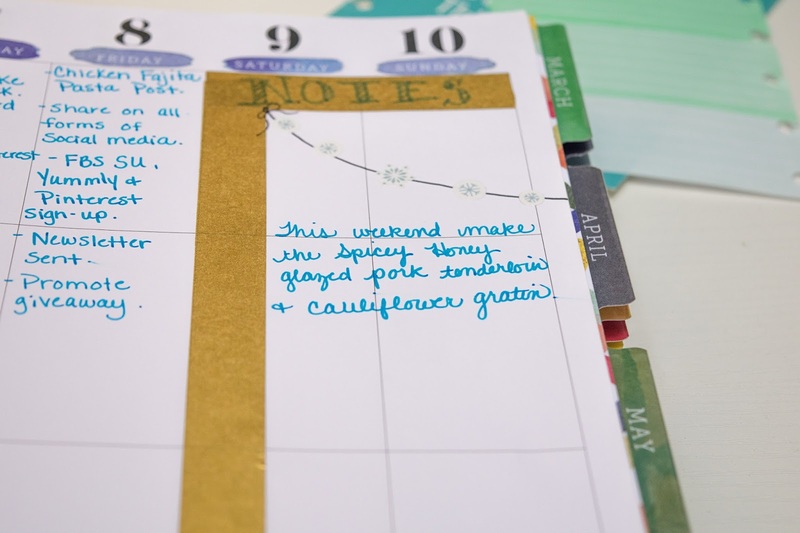 As I did with the MaaG page, I use the "NOTES" section on the sidebar for my weekly goals. Since I take the weekends off as a blogger, I don't use that section. Instead I block it off with washi tape and use it at a section to make notes, jot down ideas, reminders, etc. One of the modifications I made to my planner is adding the extension tabs. I did this so that I could have a place that I can keep track of the business end of my blog. I categorized each section into "Blog Stats", "Blog Goals", "Evergreen Content", "Passwords", "Finances", and "Blog Ideas". For my stats section I have the entire year listed down the side and each area I want to track listed at the top. This way I have all of that info in one place and can easily see growth or loss. The goals section is pretty self explanatory. I wrote down the goals I have for my blog, as well as my social medias. Not only that, but I laid out a plan of action to achieve them. For the passwords section I have the web address, username, and password. Now, I don't take my planner out of my house. If you do, you may want to omit this section. BUT, I do recommend having SOMETHING like this SOMEWHERE. I have accumulated quite a few of these in the last two years, and I am always getting them mixed up. For my finances section, I have that broken up into a few section. First of all, an overall assessment of what is in my accounts and what I made/spent every month. Then, I have a monthly expense report. This is where I keep track of the bills I pay out of my income. The miscellaneous expenses page is for me to log any purchases I make for my blog. A camera lens, prop, educational material, conferences, etc. I also purchased these cool Post-It note pockets for my planner to keep all of my receipts in until I log them, and place them in a permanent file. Then there are the sponsored post companies that I work with. I have a page for each one of them. I track when the post went live, the title, the fee, and what I spent/made. So there you have it! 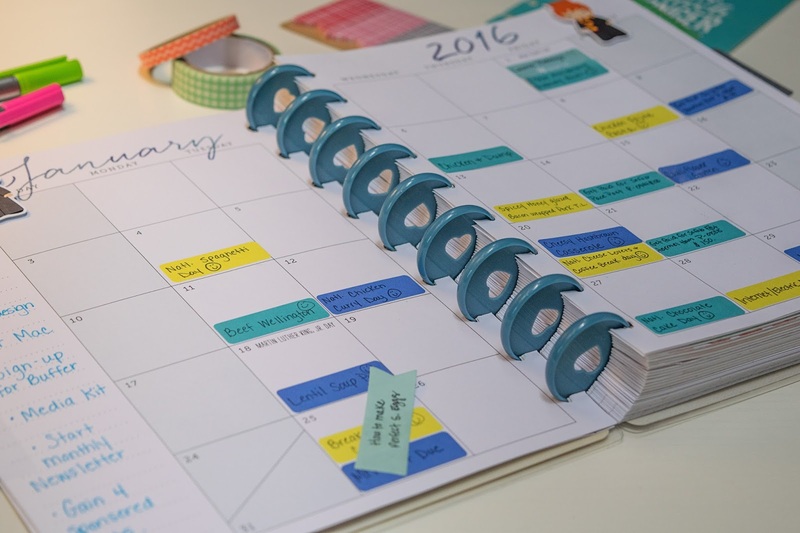 How I turned my Happy Planner into a blog planner, and now you can too! I hope you found this helpful, and I hope this leads to a great blogging year for you! Also, I'd love to know any suggestions you have that I could add to make this even MORE effective! I've been looking for a label I could use for this very purpose. Thank you. 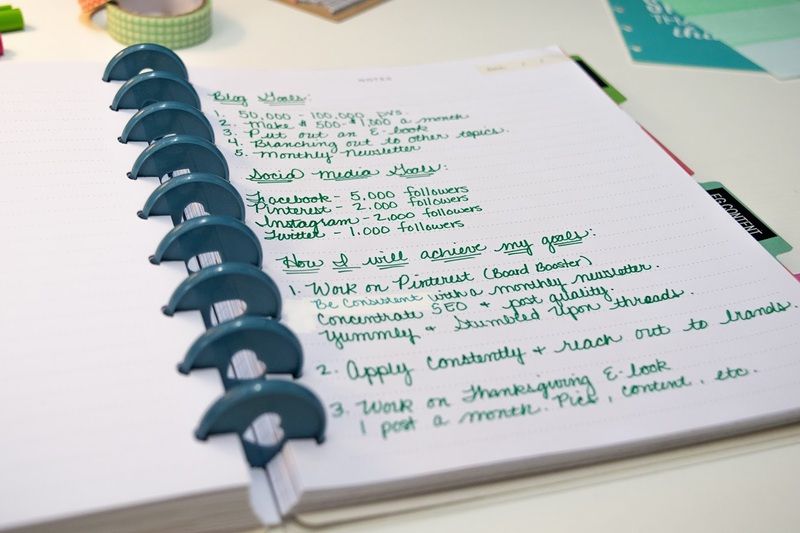 You are exactly right in that there isn't much about how people use their planners for blogging. So glad I came across your post! While I'm not new to the world of planners, blogging is pretty new to me. Thank you for sharing what you do. Very helpful ideas. I have actually changed and updated a few things! I should really do another post because, no, there is not a lot out there for how to use blogging planners! Thanks so much for reading! An update would be great! I'm all in for new ideas. I vote yes for an update! Hi Chardea! Ironically enough I am doing on at the end of December. I changed a lot through last year, and I feel like I have a good system, and I can't wait to share it with everyone. Thank you for the tips! I am new to blogging and have spent so much time trying to find the "perfect" planner to use for my blogging and this post was my much needed answer.